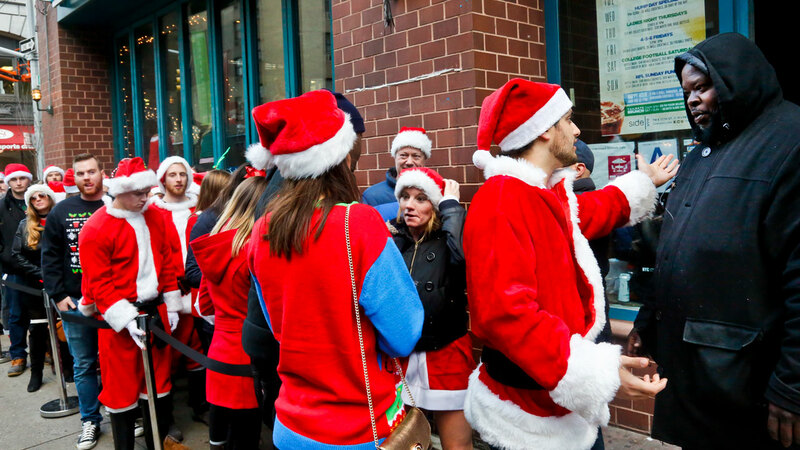 HOBOKEN, New Jersey (WABC) -- This weekend saw several new additions to the naughty list, as police officers were punched, spit on and pounced onto at SantaCon in Hoboken on Saturday. In total, 17 people were arrested during the rowdy annual pub crawl, and the Hoboken Police Department responded to 289 calls for service between 12 p.m. and 4 a.m. Fifty-five people were transported hospital, but no one was seriously injured, despite several reports of fighting. Police say several of those arrested resisted - and a few fought back. This includes 22-year-old Ashley Astalos, of Linden, who allegedly punched an officer in the jaw with a closed fist in line at the Shannon Bar. As officers placed her under arrest, authorities say she continued to swing her arms to prevent handcuffing. Astalos was charged with aggravated assault and resisting arrest. Another arrestee is accused of spitting in an officer's face at police headquarters after he and three others were arrested for engaging in a fight outside of Cadillac Cantina. Juan Carmona, 22, of Parlin, was charged with two counts of aggravated assault. When two Hoboken police officers attempted to break up another fight in line at Mills Tavern, one officer fell to the ground. As another officer interceded, 22-year-old Justin Balaban, of Middletown, allegedly jumped onto his back, and the two had a brief scuffle. Eventually, three defendants were arrested and face assault charges, including Balaban; 22-year-old Jared Mosier, of Belford; and 26-year-old Isaac Parnass, of Bloomfield. A fourth suspect fled the scene. When police approached 21-year-old Janelle Chirino, of North Bergen, who was kicked out of Hoboken Bar and Grill, she reportedly became agitated. Police say that in an effort to leave, she struck an officer in the face. Police requested medical attention, and Chirino continued to resist as she was put onto a stretcher and taken to the hospital. Chirino faces aggravated assault and resisting arrest charges.